New book “Family Zealous Love Stained Historical Poetry” from Page Publishing author Patricia Ann Taylor is a prolific work that delves into the emotions and philosophies of the author. Patricia Ann Taylor, a poet, writer, and author, has completed her first book “Family Zealous Love Stained Historical Poetry”: a gripping and potent book of poetry that speaks the authors mind on love, life, honesty and self-awareness. Published by New York City-based Page Publishing, Patricia Ann Taylor’s poignant book of poetry is both philosophical and creative. Want to read a great book of poetry? 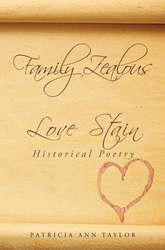 Patricia Ann Taylor’s “Family Zealous Love Stained Historical Poetry” is the perfect choice! This work of poetry puts the authors’ prospective on love, life, self-awareness, philosophy, and creativity into beautiful words. Readers who wish to experience this potent work can purchase“Family Zealous Love Stained Historical Poetry” at bookstores everywhere, or online at the Apple iTunes store, Amazon, Google Play or Barnes and Noble.